Ask students to brainstorm a list of of what they believe to be the top 10 healthiest seeds. Share as a class. View the Top 10 Healthiest Seeds YouTube Clip and circle or star the seeds you had on your list that matched those in the video. You might wonder why you should include seeds in your diet….today you will find out! As a teacher, you will find two options for students to find out this information. Choose the one that suits you, your students and your time frame the best as both will yield similar results. Option A: Individually assign students the “Small & Mighty” chart with linked resources to learn more about the health benefits of consuming seeds. See attachment below. I like to have small samples of the actual seeds on hand for students to taste test but this is certainly an optional activity. Option B: Divide students into groups of two and assign each a seed to investigate using a minimum of 3 reliable internet sources. They must create an Adobe Spark Page/Post on the seed including: Name, Picture, History, Nutrition & Health Benefits, and Ways to Eat or Incorporate into the Diet. Students may bring in a sample of their seed for students to taste (optional). Students will create their own chart for notes as they fill in the information as it’s presented. You may also wish to use this video either as a resource for completing the chart or as a review depending on the option you choose. An optional review activity would be to create index cards or quizlet flash cards with seed/picture on one side and the health benefits on another card. Give each student at least one index card (either a card with name/picture or a card with a health benefit) and have them mix and mingle trying to find their coordinating information. This could also be made into a small group activity by making multiple sets. Give one set of cards to small groups of students. The student group/team must match up the cards (same as above). Go over the cards as a class to see if correct. The team with the most matches, wins! 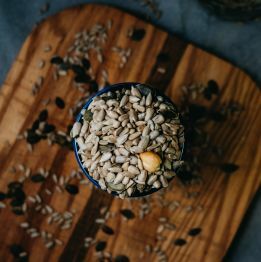 Sweet & Spicy Pepitas (Pumpkin Seeds) (Word)–We made these with mixed results. Many liked them and others not so much! Lemon Poppy Seed Pancakes These are always a hit! Banana Oat Flaxseed Cookies–These are good, but do include almonds, but you can sub raisins for them if you are in a nut-free school.